Tyler Scott is a dentist at La Clinica. He joined the organization in 2012 and enjoys seeing patients at both the East Medford Dental Clinic and on the mobile health center. As the dental prevention and outreach director, Dr. Scott enjoys working closely with the Happy Smiles program and the mobile health programs. A graduate of Oregon Health & Science University’s School of Dentistry, he also has a bachelor’s degree in speech communication from the University of Utah in Salt Lake City. A native of Haleiwa, Hawaii, on the north shore of Oahu, he grew up in Utah and now lives in Medford with his wife and daughters. 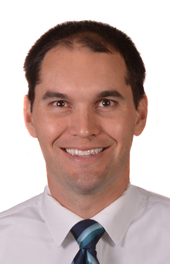 Dr. Scott is a passionate sports fan, and loves to hike, camp, travel, and spend time with his family. He is a regular volunteer at his church.